Situated just off 29th and Quebec on the West end of the Stapleton neighborhood lies a quaint town center that has a plethora dining options, boutiques and services. Enjoy coffee, bagels, fresh bread & pastries, NY style pizza, sushi, noodles, burgers and sandwiches at one of the many great restaurants. Grab an ice cream cone at Cold Stone Creamery and sit out on the Founders Green on one of the many picnic benches. Shop for flowers and trinkets at Amore Fiore or shop for ecofriendly products at Semplice Boutique. Or if you are a yoga enthusiastic, take a hot Bikram class at Core Power which is sure to have you sweating. You’ll also find services that range from a dog wash to dentists to dry cleaners to King Sooper Grocery Store. 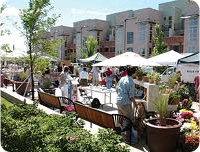 One thing is true about the 29th Avenue Town Center is that it brings people together and that’s what the Stapleton neighborhood is all about. Looking for Stapleton homes for sale? Contact the Neir Team today for more information!